I loved this book, it was great. 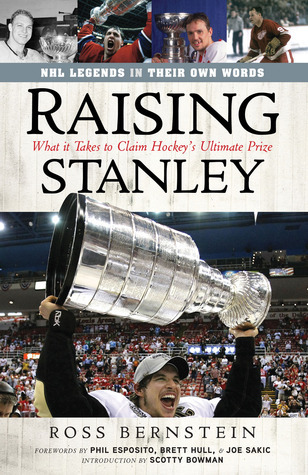 In “Raising Stanley: What it Takes to Claim Hockey's Ultimate Prize”, Minnesota-based author Ross Bernstein provides a series of quotes and anecdotes from various individuals – mostly players – who have been both skilled and lucky enough to have their names engraved on what is arguably the most famous trophy in sports, the Stanley Cup.Bernstein interviewed many players from championship teams, along with a few coaches, scouts, and executives. He got their thoughts on things like “What it's like to finally fulfill a dream like winning the Cup”, “Handing off the trophy”, “Teamwork”, and others. The quotes were gathered by topic, then arranged in alphabetical order of the person providing the quote. This organizational style results in what I consider to be the book's failure. After the introductions and forewards, we have 100 pages of hockey personalities, from Brian Bellows to Steve Yzerman, telling us “It felt great to win the Stanley Cup; it was a dream since I was a boy.” Most of the quotes felt repetitive. Mr. Bernstein somehow managed to make hockey seem boring! The book would probably have been a LOT more interesting had the author reorganized the work in a different manner.RATING: 2 1/2 stars, rounded up to 3 stars. If I could give a 6 star I would. This book is a must for any hockey fan that knows how sacred the Stanley Cup is and the dedication it takes to win it. The forwards and intro set this book up perfectly in all its pureness. Bernstein didn't want to paraphrase what these players, coaches, and GMs said as most authors do; he wanted the exact words expressed showing the deep meaning behind winning the cup. What's amazing about what Ross does is he grabs quotes from grinders, playmakers, role playings, coaches, and players who barely got ice time from 50 years of cup winning teams! Remarkable. We don't just hear from Brett Hull, Yzerman, and Crosby, but we hear from the other guys that complete the team and make it possible to win the cup.Ross Bernstein takes such a different approach to a book and makes a perfect tribute to sports greatest trophy. The only way possible to express what it means to win the cup, is to have direct quotes from those who have actually done it. This is a must for all hockey fans. This is a great book for any hockey fans. Raising Stanley has entries from all of the greatest hockey players to ever live. The players talk about what it takes and what it is like to win a Stanley cup. The players know that it is such a big deal to win the Stanley cup and they want to send that message to anyone reading the book. The players also tell their story and what they went through to get there. It was not easy for most of them but in the end they won a cup or two. One of the players in the book said "It was great what we had, and we used it to win". The players are sincere with what they say and how they say it. I would give this book a four out of five, it is a great read but doesn't have a story line. This is a great read and I would recommend the book to any hockey fans. Was great. Enjoyed a lot. Themes that come through in nearly all the stories- sacrifice, teamwork, persistence, hard work, discipline, mental toughness, confidence, patience and passion.